Address: 8629 E. Tides Dr. 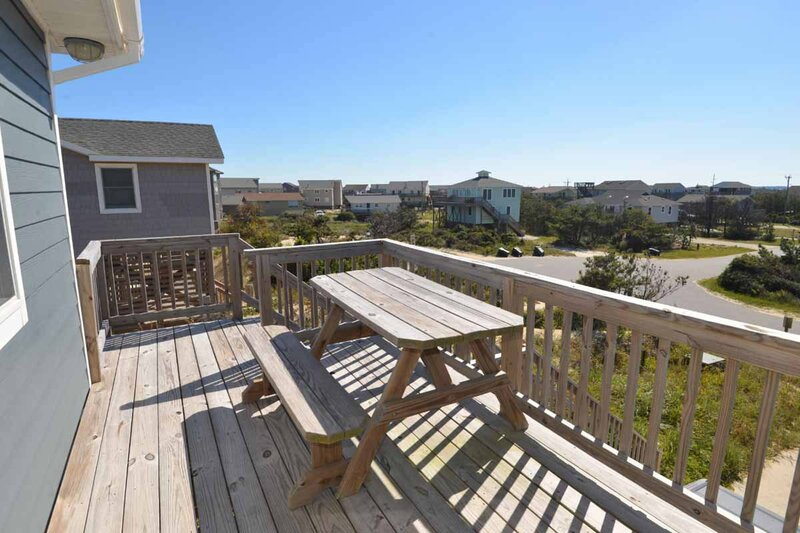 Outstanding views of the Ocean & Beach await when you choose this great Oceanfront Beach House for your Outer Banks vacation. This is a lovely home w/many special touches & a fantastic location that is sure to please. Ground Level: Parking for 3 Cars, Ramp to Main Level, Outside Shower, & Charcoal Grill. Main Level: Living/Dining/Kitchen Area w/Cathedral Ceilings, Flat Panel HDTV, DVD, Ocean & Beach Views, 4 Bedrooms (2 w/Queens, 1 w/2 Singles, & 1 w/2 Bunk Sets), 2 Full Baths, Florida Room w/Ceramic Floors, Furniture, & Ceiling Fan, & Sun Deck w/Furniture. Features include: C/AC & Heat, Washer/Dryer, Dishwasher, Microwave, Phone (Free Calls in Continental US), 5 HDTVs, 5 HD DVDs, Wireless Internet, & Bike Path. No Pets. This is a Non-Smoking Unit. Home is not wheelchair accessible - bathroom doorways are 23" wide. The home was lovely... Perfect location and clean. Over all we really loved the house and location. The layout was great. Very clean, well thought out home: from the ease of rental, to the keyless entry, to the hose on the deck, to the deck chairs. The layout of the home was perfect and the location was top-notch! Our family thoroughly enjoyed our stay! The Sandcastle was appropriately named. Nestled right next to the ocean. The decor made the home feel cozy and welcoming. Loved the open concept with the kitchen and family room. Great views of the beach and ocean from every room in the house. Truly enjoyed the deck through out the day. The ramp was a nice feature, made moving in and out of the house so effortless. We will definitely be scheduling another stay at this home in the near future. The open floor plan was excellent with well equipped kitchen and comfortable seating in the living area. We LOVE the view! Beautiful windows, great couches, love the orange high seating chairs! Such a perfect location! We really enjoyed the large windows with the gorgeous views! This home will not disappoint when it comes to convenience, views or comfort. Plenty of space for eating, relaxing and sleeping. Beautiful, beautiful views from the inside and on the deck! I highly recommend this home. Sandcastle is a wonderful house for your beach vacation. It has huge windows that give you a gorgeous view of the ocean. The house is open and welcoming. You will love your stay at the house. Thank you for such a wonderful place. Our 11 year old son is in a wheel chair so the ramp you have worked great for us. My wife said there is nothing about this house I don't like. We loved the house and will be back next year! You will not regret choosing The Sandcastle. It broke our hearts to have to leave.